Some people love Amazon; others hate it. As a consumer, I’m definitely in the first group. I’ve been using Amazon since August 1999 (my first order was for a Peanuts book, if you’re interested). I have bought a lot of items from Amazon stores in three different countries. That’s because Amazon knows a lot about eCommerce optimization. Let’s look at some of the tactics Amazon leverages particularly well. Here are six reasons why Amazon usually persuades many of us to spend some cash. As consumers, one-third of us want a more personalized shopping experience, says research from Infosys. 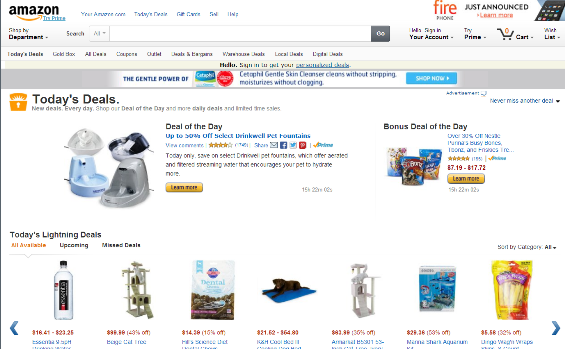 That’s been shown to boost conversions for other retailers, and it’s something Amazon delivers. Amazon rocks personalization. In fact, it’s a little bit scary how much they know and how quickly they can respond. Over the years, I’ve seen their on-site recommendations get better and better till almost every product recommended is something that interests me. And then there are the personalized emails based on items you have looked it. A couple weeks ago I went online to scope out laptops and digital cameras for a family present. Within a day, I had two emails from Amazon. One offered me a discount on an item I’d already looked at; the other showed me some similar products. In the past, these emails have taken me back to the site to make a purchase. the use of your name above the account link. 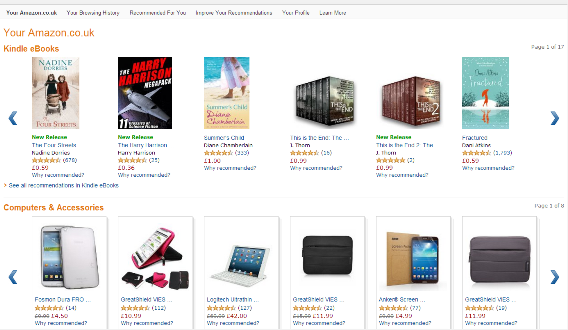 the use of your name to provide a personalized store at the top of the page (e.g. Sharon’s Amazon.com). the list of recently viewed items. All of these increase the likelihood that you will buy. If you get one of those emails, buying the product is quick and simple. 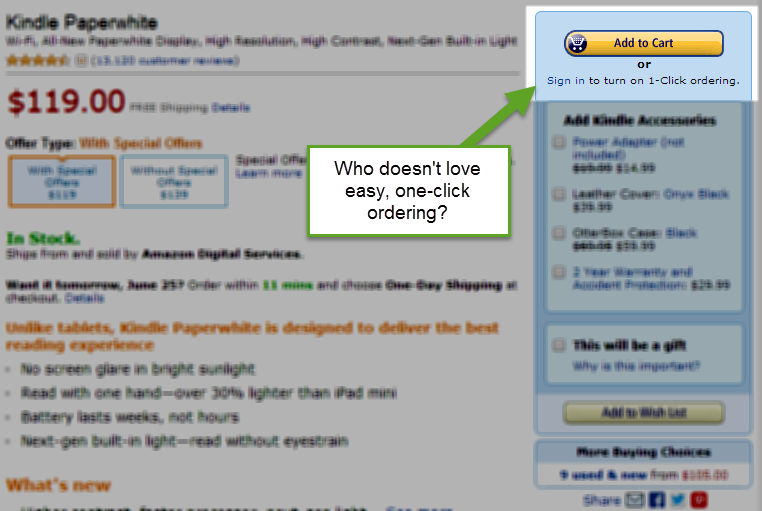 A Conversion XL study outlined a 5-click process, but if you’re already logged in and using 1-Click ordering (such as when buying a Kindle book, for example), you can complete the purchase in 2 or 3 clicks. Since slow and complex shopping carts kill conversions, this speed is a big win for Amazon. 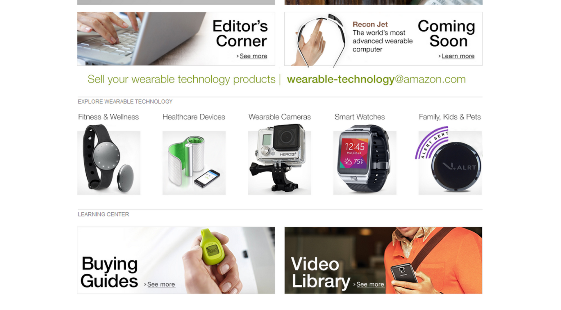 Added to that, whenever you log in to Amazon, your cart is there, with any items you previously added. Since 24% of shoppers leave their cart with plans to come back later, the ability to resume where you stopped is a big advantage. Notifications of price changes at checkout are another encouragement to complete a purchase. Credit card purchases with Amazon are generally easier than on other sites. Once you have added your card, you only have to enter it again if delivering to a new address. While that’s a minor annoyance, if you’re mostly ordering items for home delivery, it’s not a major issue. An article on KISSmetrics shows the importance of positive social proof and the influence of other people’s stories on the purchase process. It cites research showing that two-thirds of shoppers are more likely to buy if there are product ratings and reviews. Amazon has both, making it my first port of call for online shopping and product research. 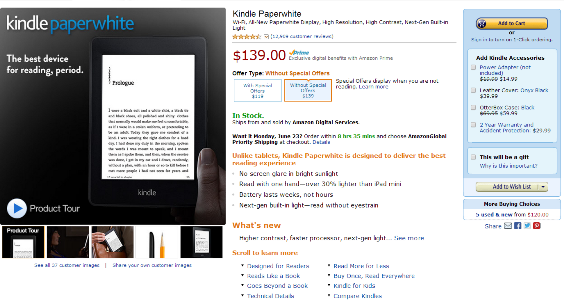 Most products have hundreds of reviews; some, like the Kindle Paperwhite shown here, have thousands. If nearly 10,000 people rate a product highly, then it’s probably worth considering. Amazon displays both favorable and critical reviews, building trust. The ability to use the reviews as a filtering tool so you only see the most highly rated products is a big plus, too. Many products also display customers’ questions and the answers so you get a rounded view of any product. I personally use reviews to identify use cases that match my own needs. Something that’s a deal breaker for one shopper might be a feature I like. A Visual Website Optimizer study found that using large product images can boost conversions by 9%. As we’ve shown before, images are great for showcasing product benefits, adding credibility, providing context and firing buyers’ imagination. Amazon doesn’t nail this every time, in my view, but when they do, it’s a beautiful thing. While there are still some products without images, many now add video to the mix, enabling buyers to see products in use. Not only can you get a 360° view of most products but you can see color variations as well and you can look inside books. All of this helps you make the decision to buy. As a wordsmith, I gravitate to the text, and descriptions that tell me exactly what I’m getting in easy-to-understand language so I feel confident about making a purchase. The description of the Paperwhite’s benefit for readers (easy to read in any lighting conditions) is a good example of this. The other great thing about Amazon is that shoppers never have to look far to find all the options for a particular product. Colors, variations, new, used—it’s all there on a single product page, which makes it more likely that they will buy. The highlighted box that shows shopping options is a master of economy, showing you the price, offering you Amazon’s Prime service, highlighting savings, and allowing you to choose faster shipping. Combine that with a distraction-free checkout and it’s a winner. Upselling and cross-selling provides a big revenue boost for e-commerce sites. Amazon does this well. 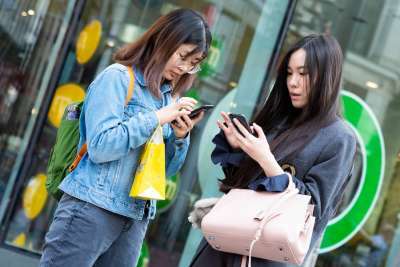 It shows what people who looked at the same products eventually bought, encouraging shoppers to check out these (sometimes more expensive) products. And it bundles items together: Buy any smartphone or tablet and you’re sure to be offered a bundle with a stylus and screen protector. Add in some savings on the bundled products and there’s another incentive to buy. Navigation and search are two aspects of what Moz calls the Holy Grail of E-commerce Optimization, and Amazon does this well. Considering the number of products available for sale, it’s amazing that you don’t feel overwhelmed. In part, this is because of excellent filtering. 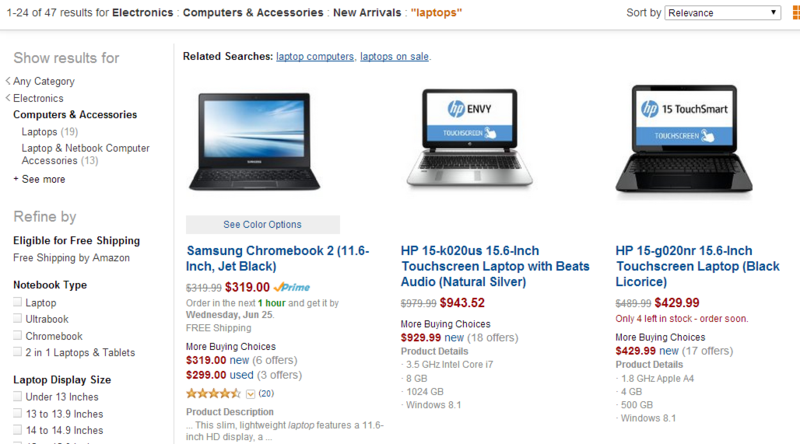 In this example, I was able to search for a laptop, not just on price and star rating, but based on operating system, brand, internal memory and more. It’s a great way to build confidence that you’re finding the right product that meets your needs. Amazon also does a great job of showcasing the most popular items in a particular category, while providing easy access to a full directory for easy refinement. Amazon has also made it relatively easy to find information about the shipping, returns and other aspects of the shopping experience, though I haven’t always found exactly what I needed here. There’s only one area where I feel there’s still room for improvement: the cross-platform experience. While shopping on Amazon on my tablet is similar to the desktop Web experience, trying to buy books on a Paperwhite isn’t such a great experience unless you already know what you want. I’d love to be able to use the same search and sort functions there as I do on my PC and have them work seamlessly. With 40% of shoppers using multiple devices to complete purchases, this is a must. Other than that, Amazon has the ecommerce conversion optimization funnel down pat. Any visitor to the site will find it easy to discover interesting products they want to buy. That is, after all, the point of ecommerce.